Cruising the FTW blog rolls these past weeks, I found some interesting things from members who have used what they found on From the Warp to help them with their hobby. Stuff I figured I'd pass along to you guys to check out to see what they're doing with the info they pick up here. After seeing what a wash can do to Atomic Spud's Ultramarine Scouts, I believe in them even more now. It just goes to show you a good paintjob with some selective washing carefully applied can result in a nice looking model. His Sergeant Telion looks great. Hopefully he'll push his washing and weathering even more and I'll have someone else in my corner that loves the grim, dark look to their models. It all starts with a wash though, That's how it worked for me. You can see his full post here. Mechanical Volition took the idea of using the right materials to base your models with and went the extra step on his Tau Fire Warriors. The difference is there, adding that last bit of grass, that rock or skull, makes all the difference in the world. Often times it's that one last piece or detail that brings a model to life. 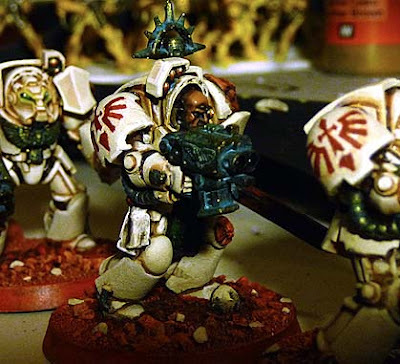 Confessions of a 40k Addict has some wonderful looking Deathwing troops with gorgeous freehand markings on them. Suitably bulky and the whole design fills out the shoulderpad. It doesn't matter that the designs might be slightly different on each guy. When you put the whole squad together, it doesn't matter at all. Freehand will always be my favorite way to go. If you've got a post on your blog that shows what you were able to do with something you picked up here and it links back to FTW, let me know about it so I can highlight what you're doing! And there you have it folks, three more members who have done some great work recently that I wanted to share with you. 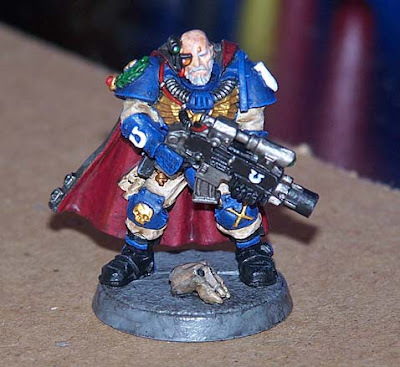 Ron, seems as its YOUR fault im now doing minotaurs, how about a freehand tutorial on painting the NEW chapter badge! i think you will find it easier than it looks! All those articles look great. The Sargent is very impressive and I have to say, I love my washes! And I do have to agree, it's the small details that are not the model that bring it to life. I've just finished my Space Wolves, and if I linked back to any of your tutorials, I think I'd have a long list! Your site was one of the first I came across and your tutorials are really detailed and easy to follow. I read on your tutorials for sponge weathering, freehanding details, object source lighting, layering and tried them out on my latest Wolves. They're all really useful and there's still more of your tutorials that I want to try out myself! Marsekay: Freehanding the new Minotaurs symbol huh? My initial thoughts are that it would incredibly easy to do. It's just a couple of lines really. That being said, let me see if my idea works and I'll post the results. Itsacoyote: Long list or short list, I try and share what others do when they pull and use stuff from FTW. This is my way of saying thanks for letting folks know about the site and how it's affected your hobby. Thanks for the mention, Ron. I've found that washes go a long way towards toning down the cartoony look of an army as brightly colored as the Ultramarines. Also, I agree with you and Confessions; if you can't get shoulder pads with raised markings, freehanded logos are the way to go. My inability to apply the Ultramarine decals to the curved shoulder pads of my first Tactical Squad was the best accident that could have happened. 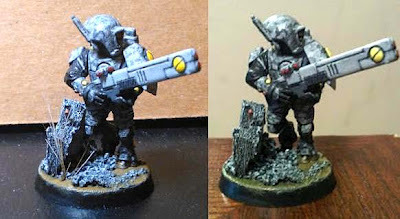 I was initially concerned by the small size of the Scouts' shoulder pads, but I was eventually able to adapt my technique to painting their logos too. A definite thanks for the feature! It's definitely an honor to be included. I'm really learning a lot from the other artists in the community and it's great to be able to pass on what I've been learning as I dig deeper into the hobby. The links presented on this sight have been a huge resource for me and it's great to be a part of it. Again, thank you for all that you do for this hobby community, Ron. Thanks Ron, if it wasn't for your tutorials and advice I don't think I'd have had the courage to give it a go. Too much procrastination and not enough balls to just try it, even if it fails. Ijanus Enitorus: Thanks and I appreciate you sharing what you do too. dwez: Those are some of the best things... the failures. I've found those to teach me the most sometimes. Besides, you can always strip the model and start over if it goes that wrong. Great writeup on basing there, thanks for bringing that to my attention. My Deathskulls need basing really soon, this has helped me to make some decisions about what way im going to go! Tempest: Excellent, I'm glad the post helped you decide on how to do your basing.